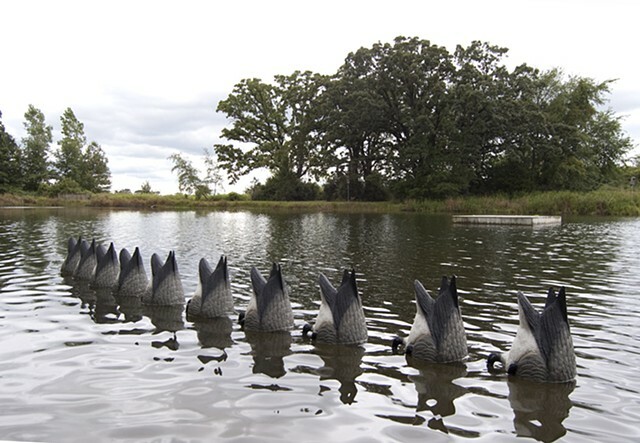 Goose Lake is one of a series of outdoor installations using Canada Dipper goose decoys. It is both a homage to Ant Farms Cadillac Ranch (http://www.libertysoftware.be/cml/cadillacranch/ranch/crabtr.htm), and a rethinking of the premise of that work for a contemporary suburban context. The Canada Goose has become ubiquitous in suburban settings and is now frequently considered a pest. Human intervention in the environment such as corporetums and forest preserves with lakes and mowed lawns has encouraged overpopulation of the bird, and a disruption of their migratory patterns. The Canada Goose has become a poster bird for human interference and its ecological consequences, favoring one species and leading to year-round occupancy in a formerly migratory species. In the same way that the Cadillac represented a way of life in the 70s focused on gas guzzling consumerism, the Canada Goose has come to represent a tipping of the eco scales through human mismanagement in the 00s. The geese have so far been installed in a lake and a forest; a few of these geese took advance training (wading pool). Future installations will include: a suburban lawn, a divided roadway, a suburban rooftop, and a classroom.